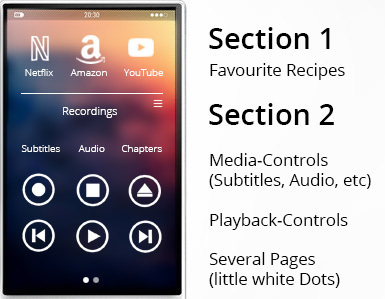 Currently, a screen with rooms leads to a screen with recipes which leads to a screen with some pages of controls (such as TV-Channels, Shortcuts, etc.). I always have to start with the room selection (even if there is just one room)... I cannot put recipes on the shortcuts screen…That is a lot of different concepts and very little control for the user! Each Section can hold several pages that can be swiped through (as is the case today). As a practical example of this new system, I would put my favorite recipes in a narrow top section that will always stay visible. In a much larger lower Section I would show whatever controls are currently useful. Tip: If you like the concept of rooms, you could easily recreate it by creating a starting Screen containing recipes, named after rooms, that each lead to another Screen containing each respective room’s recipes. Similarly, for every Screen we can re-map what the different hardware buttons are doing. I might want the Menu button to do something different depending on whether I am watching Netflix or TV. Tool-Tips: When enabled, whenever a hardware button is pressed, a little tool tip slides into view from the bottom of the screen, explaining the mapping of said button (if specified, for Single-Press, Double-Press and Long-Press). 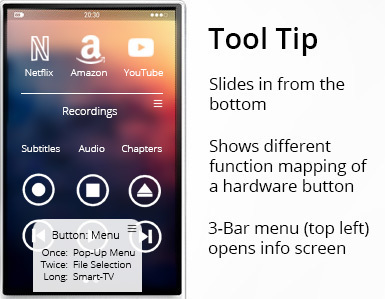 Help-Screen: In the settings menu of the NEEO Remote (three little bars on the top right) or in a similar menu directly on the Tool-Tip you can invoke the Help Screen. It will show you all the hardware buttons with their mapped functions. 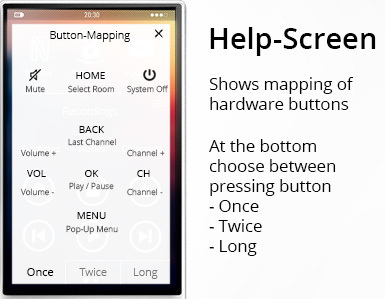 The Help Screen is divided in three tabs, showing the mapping of the buttons when they are pressed Once, Twice or Long (the remote might even cycle through those tabs automatically (until the user changes tabs himself) to make the alternative mappings more evident). This Help Screen will be quite tricky to get right, because there is very little space. It is therefore vital, that one can manually change the text displayed to explain a mapped function to something that does make personal sense (the default name of a function might not always be that descriptive). With a simple IF statement one can create quite a few recipes. And the recent introduction of Virtual Switches brought even more freedom. But what is really needed for NEEO to reach its full potential is an ELSE statement. When telling NEEO what to do IF some condition is true, it is quite often just as important to give it an alternative plan to execute when the condition is false. IF the home entertainment system is off, run the “Switch System On” recipe first, then wait for five seconds and run the “Switch to Netflix” recipe afterwards. ELSE run the “Switch to Netflix” recipe straight away. Now I don’t even have to switch the system on first. I can just hit that Netflix button and get straight to the streaming pleasure. That’s a true smart remote! Of course for this to work it would be very beneficial, If recipes can be run within other recipes as described above. Because then I can define those basic functions just once and simply reuse them in other recipes, saving a lot of programming time. And when I optimize one of those basic recipes, those changes filter through to all other recipes (because they are just referencing it). Makes sense, right? I know all those suggestions of mine would mean a radical re-design of the whole interface. But it would finally allow me to fully customize my NEEO to do everything I want and at long last truly put away all those other remote controls for good! What do you think? Are these good ideas? Where could they be improved further? I’d love to hear your thoughts! Much applause for a great post! Neeo should take note that cutomization has been on the wish list since day one of introduction of the Neeo Remote. Since everyone will have a different person preference for customizing, the bottom line is to provide full customization of every function, hard & soft buttons. There are too many assumptions for the preferred user experience. The basic screens are a good starting point but if there is something on the screen one does not use then one should be able to delete and replace with their preferred choice. Keep up the great input! I would like to have this feature too, this was the way it was handled with my loved Philips Pronto. Everything was customizable as I wanted it to have. Thank you for the nice comments, guys. I do find that most of the time in life it is desirable to make a system as simple as possible without losing too much capability. Having just one class - Screens - that can be populated with any content necessary (recipes, control-buttons, TV-Channels, pre-defined sets of controls, hardware button mappings), would give the system a beautiful simplicity. And still you could achieve anything you can today... and so much more! And just to be clear: I do love NEEO. Its an amazing product. The hardware is just stunning. And the UI is very elegant and pretty. It just does not yet deliver on its promise of replacing all other remotes for good... and with the above suggestions it finally would! I would like the remote to show all my other recipes (Netflix, Amazon, YouTube, Bluray) after switching on the system. But in order to be able to control the TV (volume, menu, etc) I need to put the command "Show TV controls" at the end of my recipe. Otherwise I will not be able to control anything with the hardware buttons. So now I have to press the Home button first to get back to the screen with my recipes again to start another service like Netflix. With my suggested redesign I would just have to press one single button (wouldn't even have to manually start the system first) to get to Netflix or YouTube. I would very much like to see someone from the NEEO team comment on the above proposal, where they see benefits, where they see drawbacks / problems. I might be overlooking something. But in my mind the proposed system would work better in every way. Bravo for this post. I could not agree more! I completely agree that the surface or the user guidance from my personal view needs a complete revision. The reasons why NEEO failed the WAF test and is not used by the family? It is far too cumbersome to use, at least it has no advantage for the family or makes things easier, no it makes things more complicated. A remote is usually located in a room with mainly the devices that are available in the room. It is thus e.g. not understandable for my wife why you have to make life even more complicated and first to select a room before you can proceed further. After NEEO already has so few keys it should at least be possible to switch lamps by a call directly on from the main screen. Only to press the room, then wait until a superfluous circle indicates that a recipe is started to turn on a lamp is so complicated that it just my wife does not use it. On each other remote I press either a button and the lamp is on or I press a button on the display and the lamp is on and does not have to dig through menus to be able to turn a lamp on / off separately. - The ability to hide the room menu level if needed completely, to be able to directly access recipes, for example, if the remote is used in only one room. - Last but not least, the whole effort does not even make sense if not even the necessary functions are available. You click through menus to turn on a lamp at the end, but you can not even adjust the color. For all these reasons, NEEO is lying around unused by my family, unfortunately. Fully agree on the ELSE statement and hardware remapping (the latter has been requested in several posts already). On the UI, I like the fact I can have several recipes active at the same time and can easily switch between them. It took me a lot of workarounds to get there and nobody besides myself would understand how my NEEO was configured but that is the price we pay for the extremely easy setup. Another thing that annoys me is that I cant setup my timezone! We usually wakeup Mo-Sa at 7am but suddenly the Stereo turns on on Sunday! I had to get rid of my wake up recipe. The Neeo remote has such a nice screen but what has been done is very, very basic and instead of improving on this you guys will release a new pro version with some other half done features? I'm thinking of switching to Control4 just because the Neeo feels like an expensive undone product. 1. We are thinking about the favorite recipes/commands which you solved with the sections. We have a similar but not exactly identical solution, it is just a bit too early to let you know exactly how we are solving this, but we absolutely understand your needs. As you can see in previous releases, we try to get more features for customization in every release (for example rearranging slides), and we will be allowing more and more customization for future releases. The idea voting section gives a good overview of all that highly requested features. Since you've also mentioned the opportunity to have recipes as shortcuts, I'll also bring this voting to your attention. I always have to start with the room selection (even if there is just one room). Please have a look at this voting as well. 2. Re-Mapping of the Hardware Buttons is also very high requested. Please vote for this here. The help screen (including the Tool Tip slide) is a really nice idea, I love it. We will definitely check that with our UI designer. 3. I know that Patrick is the very first person to immediately agree with your desire for an “OR” and “ELSE” in the recipes. Me too, and I already gave you my vote for advanced IF-statements. Thanks a lot for bringing this to the Idea Voting section as well. Nice control logo for the buttons. Much clearer than the actuals! Ingrid Thank you for the detailed reply. That was very helpful! Jakob Winter You have my full support: I was pointing out the poor Neeo UI 8 months ago and situation seems unchanged. No way to design a user friendly HMI for lighting control or to organize screens like on a 15 years old Philips Pronto or a 10 years old Nevo S70. So I am still relying on a Windows CE (!!!) based remote to control the house and AV systems until Neeo takes care of its users requests instead of trying to cover all devices in the market. Yann FREMONT for some time I considered upgrading to an S70. When NEEO came out I thought it was even sleeker looking and it also had z-wave. It was also considerably cheaper. Seemed too good to be true and in a way it was. But in all fairness, I should not expect a fully comparable product at such price differences. That being said, if NEEO had integrated IR learning - still not available! - maybe device support would not be such an issue. And why some basic customisation options are still not available is also a mystery to me. And don’t get me started on the assumption mode. I totally disagree on the price argument: come on, we are 10 years after the Nevo. You can find today a 80EUR device that runs 100x better than a 1000EUR computer of that time. And the software engineering and technology on the Nevo is so basic compared to Node.JS, bidirectional communication and all "intelligent" and up to date technology embedded in Neeo brain/remote. You can find remote apps for Android that do the job a Nevo did for low cost. For me, it is just because Neeo team is blind and concentrates on innovative features that they do not take the time to implement basic features. Again, before being an evolved and user-friendly device, the Neeo must be a real HMI. It is as if a car manufacturer released today a a car with plenty of technological assistance systems but forgets to provide the wheels and the engine. This is where we are with the Neeo. So I am still sticking to my outdated Nevo, expecting Neeo team to wake up and start working on the essential. Yann FREMONT sure, not trying to compare a 10 year old product with NEEO directly. Just wanted to say that I didn’t by the Nevo at the time (because of price) and now conclude that the NEEO story was too good to be true (best looking all in one super easy universal remote at an affordable price point). The most frustrating from my point of view is that nobody knows which feature they are working on. Or what they are planning at all. Yes the adding of new commands per device works well and quick. But a lot of topics are going since the start of Neeo (be able to decide if the device should turn of, when I switch recipes is just one of them) and no word about actual status or something else. Often this can’t be topics of rocket since. Lacking Bluetooth support bothers me as well, as this was one of the features announced. The need for a Raspi for real smart home functionality is also not what I expected when I ordered this piece of hardware. True, the interface is too complicated and communication is not transparent at all. I can literally see no point, where that new design isn't equal or better compared to the current design. And about the NEEO Pro: That does feel a bit like an insult to all the early adopters who put a lot of money and faith into NEEO. The promise of a true universal remote has jet to be fulfilled. And it seems its all down to the software. So no need for a new device! NEEO is like a super chic designer car that is announced with electric drive, petrol engine, and hydrogen drive. Is then delivered with a chic body a non-functioning onboard computer for refueling I have to get a gas station attendant and the electric drive and the hydrogen drive is indeed installed but not functional and will be brought later with an update of the board computer maybe sometime in the distant future. At least that's how it feels to me personally. Only the design does not matter to me if the remote just is not intuitive to use and can not control the devices for which it was actually purchased. Hopefully, the software gets fixed, the hardware is already there. Maybe we should form a group and create some noise in the forum to see how NEEO reacts to it ? Daniel Sütel Well, the good news is, this thread has been viewed quite a few times and also attracted a few likes. Also Ingrid from the NEEO team reacted to it with some helpful links to feature requests. So thats good. My big dream (however unlikely) would be for NEEO to try out the organizational structure outlined in the top post (leave out the fancy stuff like tooltips or different sections per screen for now) and then let whoever is willing test the system, get some feedback. That would be absolutely amazing! Daniel Sütel What do you mean by creating noise? My personal view is different. A company does not only live on exaggerated marketing but above all on satisfied customers who recommend such a product. So it's the other way around make no noise. If someone asks me what kind of designed remote control I own, are you happy with it, what can you do with this device and would you recommend it? Then I would answer, looks nice but if you want to buy it, then wait until the company has delivered the firmware updates so that the remote can do what it should. Fonzo well, if you re the Fonzo that came over from mediola to this place than I know what you mean. But I would ask how many companies , products does it need for a little bit more stick to your promises and customer focus ? I m not willing to spend hundreds of Euros again and again just for the fun to throw another good try into the trash can and look for the next big thing. This is not good enough for me as a customer. Jakob Winter personally , I would use the word expectation instead of dream. Also the occasional visits and , lets call them comments of different NEEO employees doesn’t satisfy me. most of the good help and support I got from users , people that created SDK related stuff I wouldn’t be able to create myself. Don’t get me wrong here , I believe this is exactly the way it should be but based on a solid ground created by NEEO. This solid ground isn’t there so those power users from my point of view do a lot of firefighting , imagine there would be no SDK. Daniel Sütel For me it does not help to make noise here. I posted in some discussions hoping for some satisfying response by Neeo employees but unfortunately it seems that all non positive discussions are treated with just saying nothing before creating more harm by stating the truth, that the project never will get to the point which was announced in the beginning. Daniel Sütel The mistake many smaller companies make over and over again is that they promise too much to get attention. In the end, however, the company is unable to keep these promises, which leads to customer disappointment. At the very least, NEEO is one of the companies that are definitely learning. That they advertised offensive Bluetooth support all the time but the device still doesn't support Bluetooth until today, NEEO has now probably realized that this is not good for the reputation. So they decided to renounce this statement at Amazon, until this feature is finally available, which is quite a bit more than many other companies do. What I would like to see is a clear statement when you can expect something of the basic features like to set the color of a lamp. But unless statements like we work on it, it is more difficult than expected (Bluetooth) and it will be released with the next firmware, you get only very unclear statements when some feature will be added in future. So you have to wait for the day when it finally works, or you are dealing with the SDK or external solutions so that you can use the device as you might have expected from the announcements from the beginning. Fonzo funny that, I met another backer 6 months ago and he told me that based on the feedback on this forum he decided not to unpack his neeo and wait till it delivered on its promises. I told him that was probably a smart strategy. Since then things have improved and today I’d say it depends on what you exactly expect and how much time you want to spend on it. Because, ironically, the “extremely easy set-up” means you spend ages working around it, or making sense of it. - What you do not see right away but what's the opposite of the simple setup is that you have to fiddle with recipes forever so that they are somehow reasonably useful. Here it would also help if it would be possible in the UI only one recipe to use, instead of the annoying circles then an interim screen in which one can select the output whether screen or TV. Fonzo you indeed have to fiddle a lot with the recipes. In my case primarily because for a long time it was not clear to me what neeo does behind the scenes. Anyway, you can clean up the recipe names, but will have to pick short ones ... Annoyingly, like you, I have not found a way to get different icons for some of my recipes. I also changed all the default power on / off steps in my recipes and am happy with the result (leaving aside the assumption mode for smart devices). Depending on your setup and wishes you will probably not be able to fully replicate the Logitech way. But I like the ability to quickly switch between controls (using the active now area) and between inputs (by rerunning an active recipe). I can also easily and quickly control power states without having shortcuts. But again, that depends on setup and preferences. Geert Van Der Linden still have my Harmony Ultimate besides NEEO , just in case I pull the trigger. But you know what I m still optimistic that NEEO just need a little push or organizational changes to turn in the right direction. Daniel Sütel well, each update brought something important for me, we had the assumption mode for stupid devices (everyone needs that, i have never seen a set top box that was not stupid ...) we had customisable slides (underwhelming at first, but then I found you can hide all default slides and keep adding commands to the shortcut slide so it actually solved a lot) and then the virtual switches (allowing access to recipes from shortcuts). So hopefully we will get more and quicker. Thing is, some of the customisation requests are so simple I cannot imagine it would take more then a couple of hours to implement (choose an icon for a recipe for example, I’d even be happy with the ones they have already, so no artwork or copyright issues). So why do we still don’t have that? Honestly can’t figure that one out. What would you like to achieve exactly? Lars Joschko neeo does not have the Logitech option of switching off unused devices. The advantage of that approach is that it is smart and works regardless of which recipe you had running before. The disadvantage is that sometimes you don’t want your remote to turn off those devices. Neeo is more flexible in this sense. You can stop your XBox recipe if you want to turn it off, or leave it on if you plan to switch between the two. That is the way I’ve set things up. Geert Van Der Linden that is true but it is the same as leaving my car parked with running engine for 8h while I’m working because it’s more flexible. It is nonsense! Why not let the customer decide which works for his setup best? I have added a button to turn off the Xbox in all other recipes as well, but I don’t like this behavior of switching pages to get access to the button. It is no seems less integration. From my point of view I cannot see an advantage of a smart remote when I still have to press several buttons for only switching recipes. Lars Joschko in my opinion it's not like you just said. when you start your XBox recipe, for example, and play arround, you can start the TV recipe. everything is in Power on state like you said. but now you are able to stop devices which you don't need in the now active section. when you shut down the XBox recipe, all other stuff you are using in TV is still playing and the XBox is off. Dosen't that fit your needs? Lars Joschko if you want the exact behaviour of the Logitech option to turn off unused devices without extra clicks you won’t get it with NEEO. But as nuro and I describe you can turn off the XBox recipe, which doesn’t require adding shortcuts to all other recipes. To use it you also use the touchscreen much less and more the hardware buttons which I personally prefer. nuro sounds good, but where is the now active section. When I switch from Xbox recipe to TV recipe by pressing “home” and “TV” afterwards the TV is turned to the right input and everything works good. But when I press “home” again there is only TV showed as active no Xbox anymore. What do I miss there? Lars Joschko that is part of the NEEO magic ... it drove me crazy too. What happens is the following: NEEO dictates that you can only have one active recipe per output device. So if your XBox is connected to the same TV, it hides the XBox recipe ... then, when you close the TV recipe, it « remembers » your XBox was also on and turns that off too. This is the assumption mode for smart devices. It cannot be turned off. Which is ... mind boggling, especially as NEEO initially insisted an assumption mode doesn’t fit the NEEO philosophy and instead told its customers not to buy stupid devices. In my case, I removed ALL steps from the power off sections of ALL my recipes. Then, using your example, when I turned of my TV recipe, the TV stayed on (normal, I removed all steps) but the XBox turned off?!? How smart is that! Anyway, I found a workaround! Duplicate your display device (I added my projector five times, called it projector Xbox, projector TV, etc). Then, magic happens, you will now see both the Xbox and TV recipe in the active now area! In the power off section of your Xbox recipe you put the power off command of your Xbox. So after switching to the TV, you can easily power off the Xbox by quitting that recipe. Or leave it on, in case you expect to quickly switch back. Your choice. "You don’t need to be a techie person to setup NEEO. It’s built for everyone and tested by our kids, parents and grandparents!" If my parents are reading what they have to adjust just so that the device works properly then the device is in the drawer before it ever came to use. Geert Van Der Linden Sorry to say, you call it "Magic" I call it a bad design decision aka user experience. It is far away from easy to setup or strait forward integration. For the moment I live with my workaround of having a switch on a slide in every recipe but the point is, that it seems as there will be no really good update at all which solves all the problems. 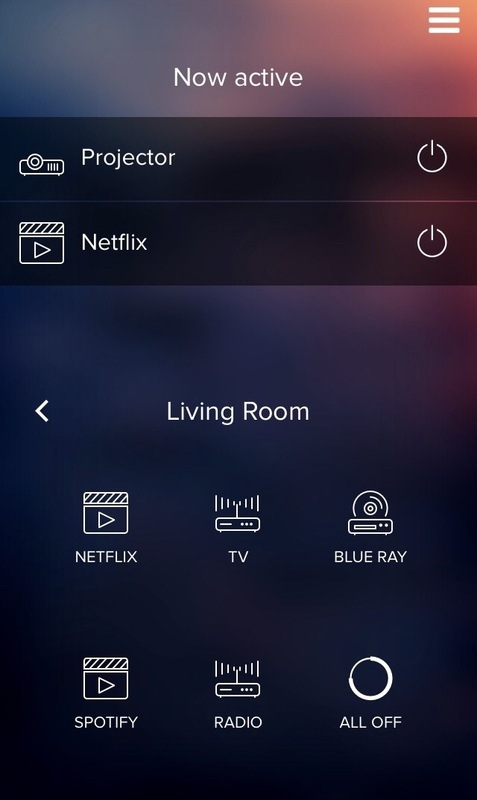 I´m still waiting that Neeo supports Bluetooth (more than just printing it on the downside of the brain), cause I have to use my TV remote every time I turn my TV to watch from the dining area. Nobody told me that I only get a normal infrared remote as long as I´m not Linus Torvalds and spent hours of my life programming scrips to get all the advertised features. Last firmware update was when? I´m still hoping that I will get the great experience which the hardware seems to be capable of, but at the moment it doesn´t is as good as it looks/sounds in the web shop. Lars Joschko I was being ironic when I said NEEO magic ... more to the point, you were not happy with how NEEO handles power states when switching recipes. I tried providing you with several alternatives to solve your problem. Including one that may sound difficult to set up but works very well for me. I also suggested you add a power off Xbox command to the launch section of your TV recipe. Should take less time that posting here and would also meet your expectations as far as I can judge them. No shortcuts or extra clicks needed. Lars Joschko sure, we are all looking forward to the next upgrade. Hope you find the good setup for your recipes and how you switch between them! They just develop a simple calculator. They describe the hardware/sofware bricks, they provide the architecture, the logic, they expose the layers and provide SDK so anyone is able to work on any level from harware to software. It is just a calculator. But see how rich it is. And compare to our poor Neeo environment and SDK: anything you want to do differently from the Neeo logic requires tricky and non-satisfactory arrangements just because the core misses flexibility. I want the different layers of the Neeo documented and accessible for customization. I want to be able to customize the UI layer and the navigation between screens. I want to add IR data or any protocol on my own (mostly possible but a bit tricky with Node.JS). I want to map the hard buttons to any command or any script. I want at least the basic programming that was possible on a Philips Pronto or Nevo SL/S70 15 years ago. I want to reduce click steps in the UI/UX to run activities, to control a light dimmer or to configure audio and video renderers in my house. I want Neeo to stop telling me pretentiously that my devices are stupid whereas Neeo system is certainly far more stupid for the moment as it does not provide any usable feature. Neeo can continue providing its "automated intelligent setup" which performs a default setup for non-experienced users but we need access to the bricks to enrich environment by our own and make that expensive piece of hardware usable. Love the original post and this thread. I hope they all come true. Especially the bigger icons! Jakob Winter Thank you for your good ideas. At least I have built my own UI for the iPhone, which I use now instead of the NEEO App. Hopefully, there are in future more possibilities to customize the display of the NEEO itself also. Fonzo that looks very cool, you built your own iPhone app? I share your hope the official UI will soon offer (far) more customisation, because the iPhone is a great platform but I prefer to use the remote. Geert Van Der Linden I did not write a complete app myself but I'm using NEO as an App Designer for years to simply click a remote interface for completely different systems together. 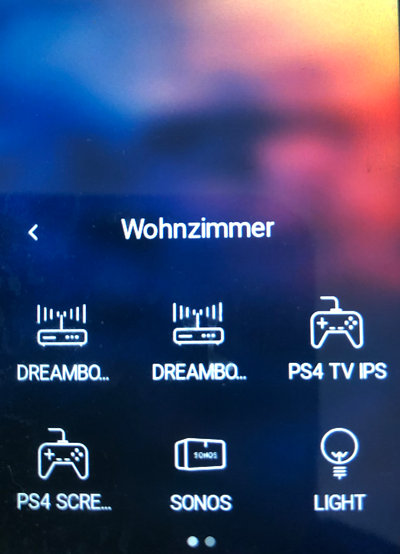 Now I have added the NEEO commands, based on your proposed design, to the remote interface for my tablets and iPhones, the graphics are already there, you just have to assign each graphics the appropriate NEEO command or NEEO recipe send via NEEO brain. So this is depending on how many recipes and devices you use a work of about 1 hour or more. The NEEO brain is controlled from NEO via IP Symcon and NEO Plugin IP-Symcon and IPSymconNEEO . However, the approach is more suitable for people who have a comprehensive home automation system either way and want to control it via a tablet or smartphone and integrate the devices, that are controlled via the NEEO and the NEEO brian. The big advantage of NEEO are the hardware keys that a tablet does not have. Therefore, this may be a solution to supplement the NEEO app and have a better UI experience but not a substitute for an adaptation of the display on the NEEO remote itself. For this, first of all, the opportunity would have to be created, either to deposit a website as a start page in the NEEO remote display, then you could also simply design web interfaces and display in the NEEO display or the SDK must finally be extended so that just a better adjustment and customization is given, for example, adjusting the icons or font size at the NEEO display. You are absolutely right, I want the hardware buttons of the NEEO remote. I am also not in a highly automated setup so this might not be for me but it is still very cool! Daniel Jordi I think you just delete all rooms until you have but one left, at which point you don’t see the welcome home screen with rooms anymore but always see the single room. In other words, good for people that always had but one room. But I assume nothing has changed in the layout of the room, so you still only get 6 recipes and would have to swipe. I am curious whether that would be an improvement to keeping stuff in separate rooms ... at some point I’ll try it out of curiosity but it’s a bit of work to move devices and recreate custom recipes and virtual switches. Geert Van Der Linden I only use one room (Living Room), so deleted the empty room (Bedroom) that was on the remote. When I restart the remote it defaults to the "Living Room" screen (with an arrow pointing to the "Welcome Home" screen. So the "Welcome Home" screen is still there, but you have to navigate back to it. Jon Iverson same with me..
the only change is, thet pressing the home button dont bring up the welcome screen. now it starts in the only active room. Jon Iverson went for it anyway and prefer the single room setup, less clicks and cleaner. I was thinking that the current firmware should have been the one at launch. We still would have wondered why there was no IR learning, Bluetooth or why the customisation options were so limited, etc. but it would have been an acceptable starting point. Now it is the end point. I suspect the main reason of Control4 to buy NEEO was to kill a competitor. So NEEO making the code open source and letting the community tinker with it is rather unlikely (although they might avoid a class action suit with it). But if they did open up the software... how complicated would some of the above features be? Interface with several pages that you can swipe through, after you chose "Show Controls" at the end of a recipe. Right now there is only one of those "Controls" screens per device. They control both the hardware mapping of buttons and the shortcuts / favourites / etc. shown on the display. Allow Parent-Child relationship of screens so the "Home" button knows where to go. Now we can get rid of "Rooms". They can simply be re-created by creating a Screen with just recipes on it. Similarly, the "Welcome" screen can be set up with this method. And as a bonus, since a Screen already comes with the mapping of hardware-buttons, I can decide to have my TV-hardwar buttons active on the home screen! So in my mind, these changes should be rather straigh forward. Not much has to be changed. I believe the code would get even cleaner since we can get rid of quite a few elements. And it would change the user experience quite dramatically. What do you think? Any coders around here who want to comment? Any developer from the NEEO team? I would love to hear your thoughts!